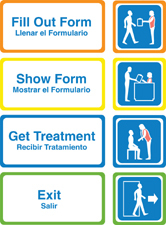 In 2007, the Cambridge Advanced Practice Center for Emergency Preparedness developed a series of pictograms designed to promote universal access to emergency dispensing sites services. The signs were developed in collaboration with local and state public health professionals, and experts in universal design and accessibility. Large, high contrast pictograms of station activities. Select from up to 10 station signs! Simple, one-word descriptions in English and Spanish. Available in 13 other languages! To obtain high resolution PDFs of the signs or for more information, please email apc@naccho.org.